Note: Enough is Enough is not organizing any of these events, we are publishing them for people across the US and Europe so they are able to read what is going on. This event is unacceptable in so many ways. It totally blurs the boundary between government and the arms trade and uses taxpayers’ money to promote unethical profiteering in the private sector. These ruthless businesses build their wealth on the rubble of schools and hospitals and on the dead bodies of the children targeted by the weapons of mass destruction they manufacture and sell across the world. DPRTE has no place in Cardiff and the city should be ashamed of hosting these dealers in death. We call on anyone with a conscience to join us to shut down this arms fair! BAE Systems, whose fighter jets have been used by the Saudi regime to bomb schools and hospitals in Yemen, as well as by the Turkish and Israeli states against Kurdish and Palestinian civilians, will be exhibiting in the “Prime Contractor Village” at Cardiff’s Motorpoint. DPRTE is open about its aims to deepen and increase existing ties between arms businesses and the government. These links between the UK state and the weapons industry have come under heavy scrutiny in recent months, with Prime Minister Theresa May being forced to defend ongoing arms sales to Saudi Arabia in the face of international criticism. With an annual spend of over £19 billion on equipment and services the UK defence sector represents a fantastic opportunity for organisations looking to supply to this marketplace. DPRTE 2017 will provide a unique opportunity to gain access to defence procurement buyers. BiP, a private company based at Pacific Quay, Glasgow, is deeply embedded within Ministry of Defence (MOD) operations, running its Defence Contracts Online, through which all MOD contracts valued at £10,000 and above are advertised. It also publishes the fortnightly MOD Defence Contracts Bulletin. Established in 1984 “to facilitate business between the public and private sectors”, BiP Solutions has had a “16-year relationship” with civil servants at the MOD in London. A keynote speaker at DPRTE 2017 will be Les Mosco, who was the most senior procurement professional in the MOD from 2007 to 2014, managing 2,500 staff and directing the MOD’s annual multi-billion pound spend. Before his seven-year stint at Whitehall, Mosco enjoyed a successful career in the private sector, with roles at the NatWest banking group, and at the US-based oil and gas business Amerada Hess, now the Hess Corporation. Less than a year after leaving the MOD at the end of September 2014, Mosco took up a position on the Strategic Advisory Board of BiP Solutions. He also runs his own private company, Commercial Strategies Ltd, of which he is CEO and director, with his wife Barbara as company secretary. It is registered to the couple’s home in Berkhamsted, Hertfordshire. Originally set up in October 2003 as Purchasing Strategies Ltd, its name was changed to Commercial Strategies Ltd in October 2014, just after Mosco left the MOD. The official event partners listed on the DPRTE website include sections of the MOD like Defence Equipment and Support, the Defence Science and Technology Laboratory, Defence Infrastructure Organisation and the Defence Export Service Organisation (DESO), which promotes arms exports by arms companies based in Britain. There is also the UK Defence Solutions Centre (UKDSC), which explains on its website that it is “an established, independent partnership between the UK government and the UK defence industry.” UKDSC claims to work with “the best of the defence industry” and names arms companies such as Raytheon, Lockheed Martin, Thales, Cobham and BAE Systems as key partners. Further official event partners at DPRTE entirely represent the interests of the powerful weapons manufacturing industry. Working towards similar aims is another DPRTE partner, NDI – Defence, Space, Aerospace, Security. The arms wing of the manufacturers’ organisation EEF, NDI “actively promotes global business opportunities for its members” and says it provides “policymaking influence to magnify the voice of the industry and individual companies”. Its “global partners” include BAE Systems, Boeing, Lockheed Martin, and Raytheon. DPRTE has been attracting protests for several years and was forced to move to Cardiff in 2014 because of public opposition at its original venue in Bristol. 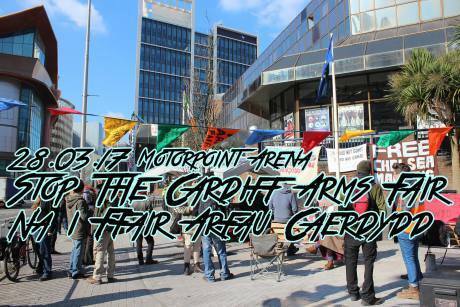 The day of action has been called by Stop the Cardiff Arms Fair / Na i Ffair Arfau Caerdydd network and starts 8am on March 28th at the Motorpoint Arena on Mary Ann Street. Repression after #NoG20 #Hamburg: Solidarity means Continue Fighting!